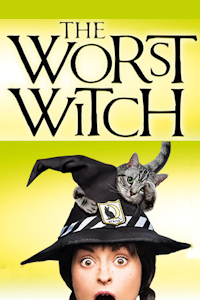 The Worst Witch tickets at Vaudeville Theatre, London. 2019. Find the best The Worst Witch kids show tickets at Vaudeville Theatre, West End. Long before Harry Potter there was Mildred Hubble. An ordinary girl who found herself in an extraordinary place: a school for witches. Now in her final year, accident prone Mildred and her fellow pupils are about to embark on their biggest adventure yet... Jealous Ethel Hallow is always out to spoil Mildred's fun. Miss Hardbroom is opposed to all fun in general. And just as Mildred sparks some inevitable mayhem certain to upset them both, an old enemy returns with a plan for revenge that could threaten not just the Academy, but the whole world. Approximate runtime 130minutes (including any interval). Book by Jill Murphy. Adapted by Emma Reeves. Producer Royal & Derngate. Producer Kenny Wax Family Entertainment. Producer Novel Theatre. Producer Nica Burns. Corporate Sponsor Michael Jones Jeweller. Director Theresa Heskins. Design Simon Daw. Music Luke Potter. Lighting Aideen Malone. Sound Leigh Davies. Other Vicki Amedume (Aerial Consultant). Design Paschale Straiton (Puppetry Designer). Director Paschale Straiton (Puppetry Director). Director Beverley Norris-Edmunds (movement). Other John Bulleid (Magic Consultant). Director Anji Carroll (CDG - casting director). Wednesday, 24th July 2019 to Sunday, 8th September 2019. Terms: BOOK EARLY AND SAVE UP TO £14 PER TICKET Valid for performances 25 - 31 July and 1 - 8 September 2019. Book by 6 May 2019. The Worst Witch tickets: The tabs above allow you to select between links to suppliers and date searching. Click on a supplier's logo to see their details and on the 'buy now' button to see and check the tickets on offer.